A light frame medicine ball, Rope BallTM has a 10mm braided nylon rope running through its core to give you control. Rope BallTM provides a challenging workout - great for rotation, co-ordination & core stability training. This is not meant for power training - high energy training will reduce the life of the ball. Like a car tyre they wear out. 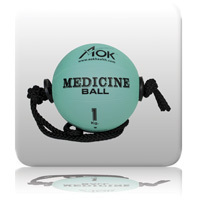 This is the baby brother to the Cyclone BallTM and offers a different training response with a faster rebound speed. It is recommended you wear gloves when training with this product to avoid rope burn & extend your training time.